Now that my husband John also has a commuter bicycle of his own, he is eager to ride our bikes together and grab breakfast again. So on Easter Sunday morning, he rode his commuter bike and I rode my Electra Ticino. 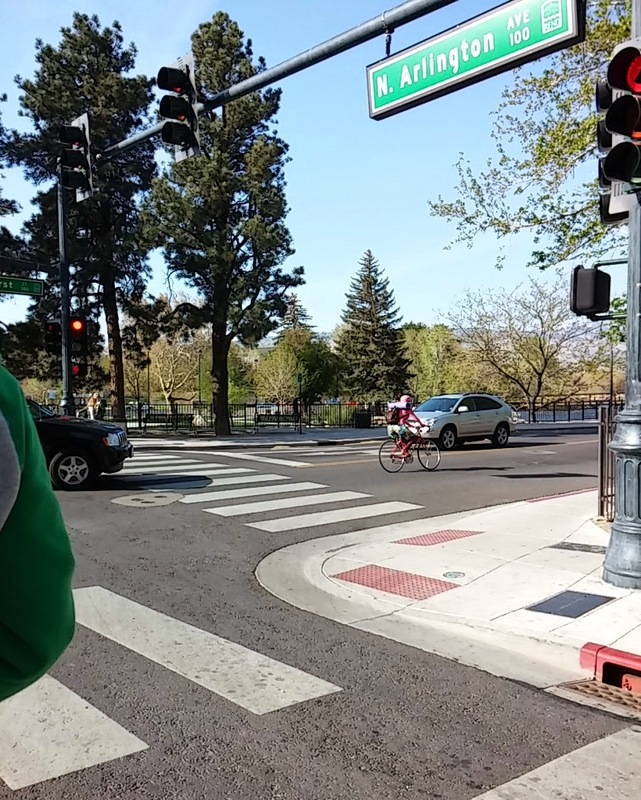 We pedaled from our home in Sparks southwest through the older part of Sparks, west along Victorian Avenue to the Truckee River Trail entrance near Kietzke. 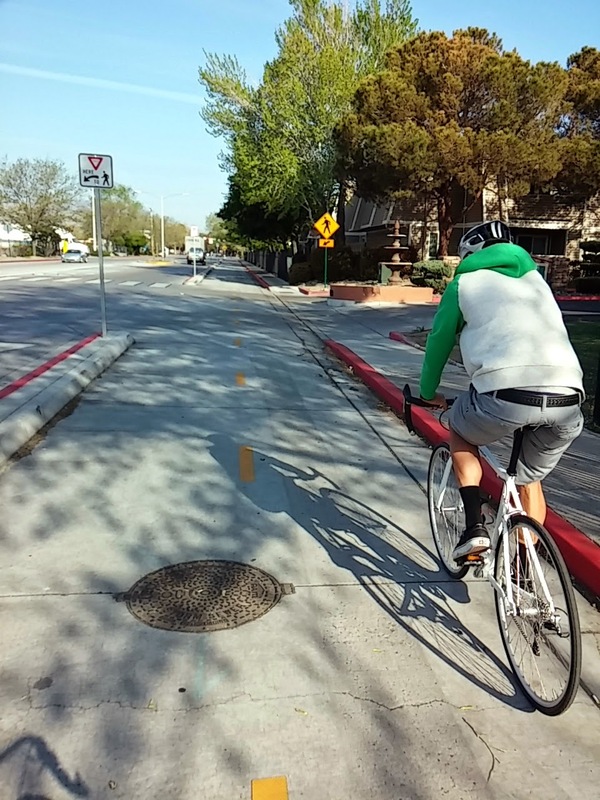 The separated bike lane on Nichols Boulevard was really nice and the bike signal to cross Sparks Boulevard allows us to proceed through the major intersection safely. We got off the trail onto 2nd Street near the Aces Stadium. I rode behind another bicyclist who was surely commuting to work - such a great thing to see! 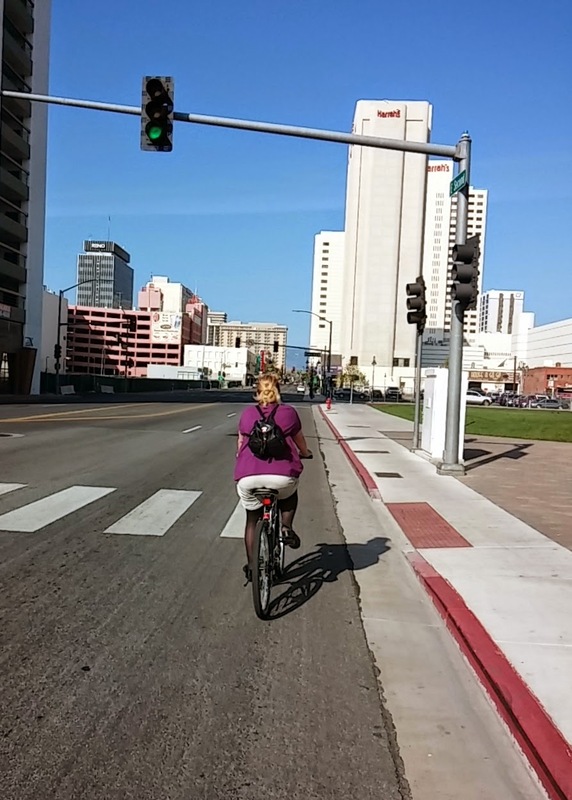 We headed west through downtown Reno and turned left on Arlington Avenue. At the stoplight on 1st Street we encountered another bicyclist. She was wearing a red helmet with white polka dots, platform heels, a dress and carried a backpack and yoga mat on her back! Not much farther on Arlington Avenue, we arrived at The Brewer's Cabinet. Although a bike rack exists in front of the building, it was far from our view (and I left my bike lock at work--eek!) so we leaned our bikes up on the patio near where we would be sitting so that we can keep a watchful eye. It was a GORGEOUS morning!! A little cool to start but as we sat on the patio the sunshine kept us warm. There were other folks at the restaurant enjoying Easter Brunch. A group of men at another table enjoyed the Kegs & Eggs Special ($15 for entree and all you can drink Tahoe beer) from the breakfast menu. John ordered coffee, a Mimosa with the Classic Hash entree and I had coffee, a Bloody Mary with my French Toast entree. For the reasons above, I am bringing six other women back the following Sunday for our first Women's Bike to Brunch event. By the way all women are invited to join the Bike to Brunch, whether they ride a bike or not. They can still share in part of the joy of cycling and that is good food, great conversation and meet other women!! 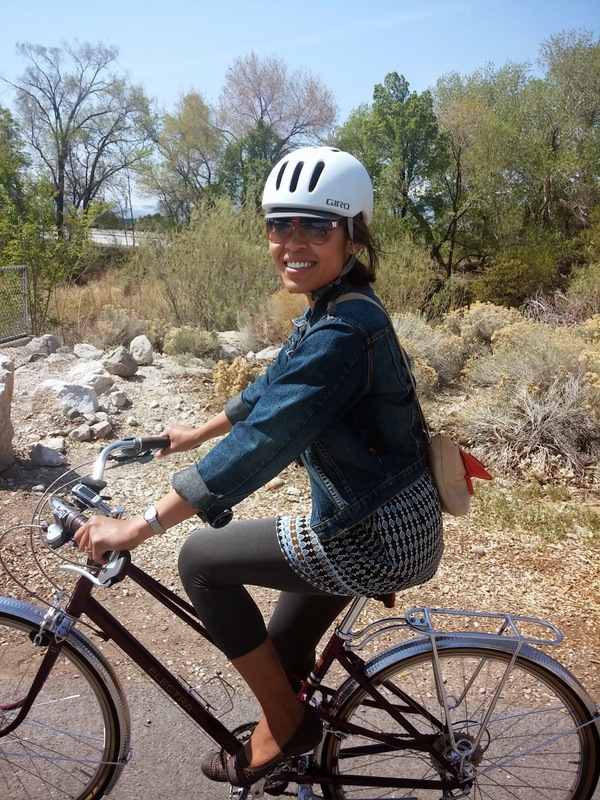 The Cuter Commuter Bike to Brunch will be held the last Sunday of each month through September and starts at 10AM unless there is a special event and we have to start earlier or later. As summer progresses we will have a pre-brunch ride through surrounding neighborhoods. So mark your calendar!! 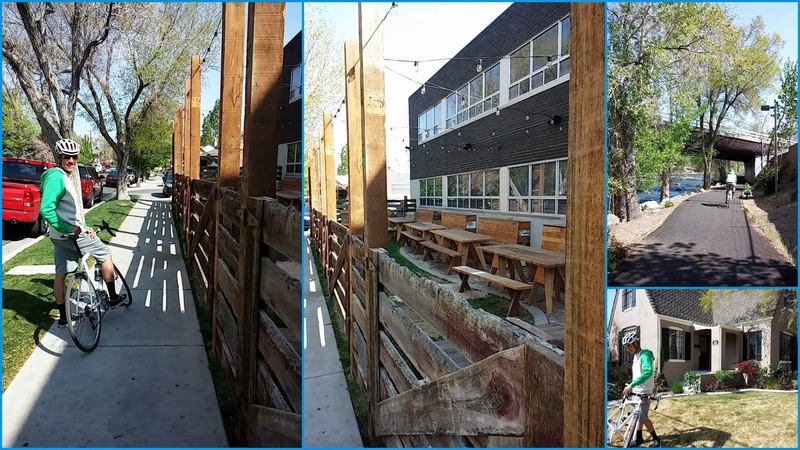 Originally, I had another venue in mind that has a great patio. It met nearly all of the Bike Friendly Business criteria except having a place to park a bike let alone six or seven bikes so I am afraid it is out of the question. I would rather enjoy the company of the women I will be with, be absorbed in the conversations we will have and savor the delicious food I will be eating than worry the entire time whether my bike will be there or not when I leave the restaurant. 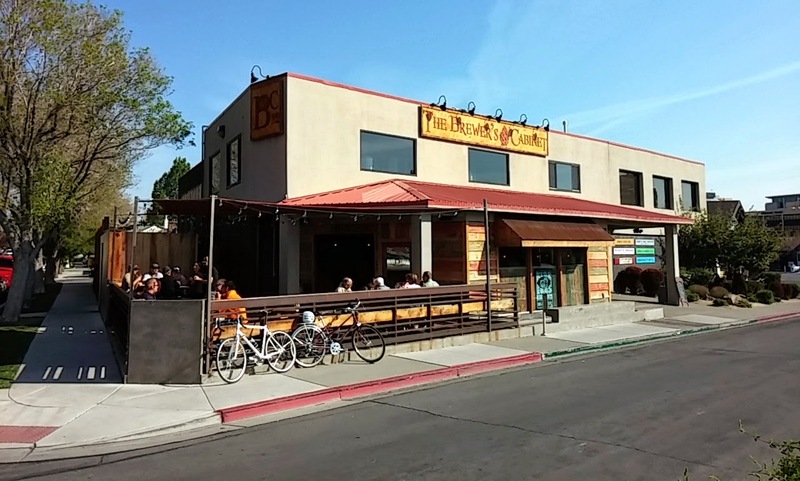 So the other restaurant is out of consideration for now, until I can write the business owner or perhaps arrange for a bike corral that we can lock up several bicycles to in exchange for a (vehicle) parking spot. The Brewer's Cabinet staff was also friendly and the food was really good. Although the coffee could have been a little hotter (I think it cooled quickly after it was poured into cold cups) it did not spoil our enjoyment of our Easter Brunch. After breakfast we rode through the Old Southwest neighborhood browsing homes for sale. Since we recently purchased our new home in Sparks, it will be another year before we can move again. 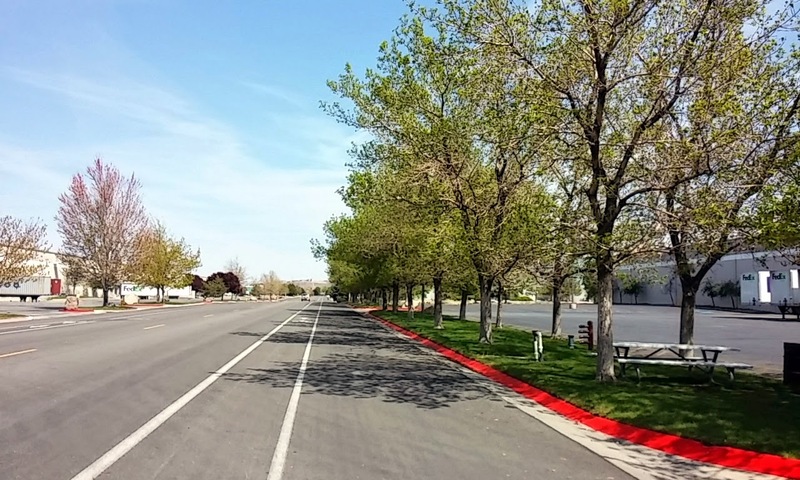 Because would like to live where there are bike lanes near our street and have safe access to each of our workplaces, searching for our next home in Reno makes more sense. 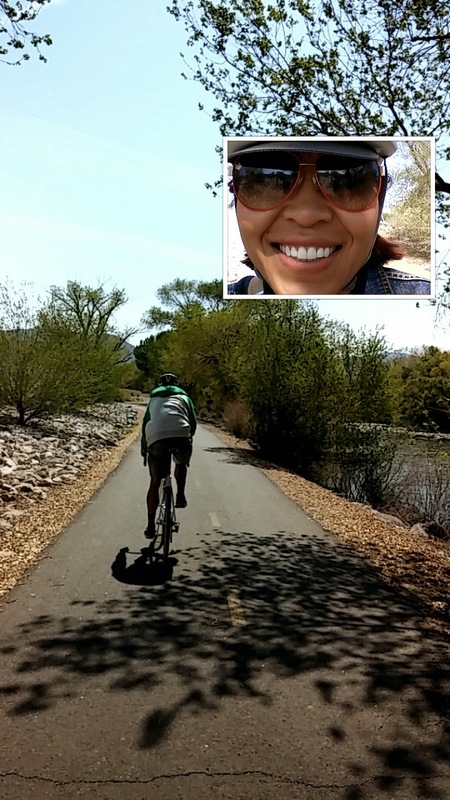 Then we rode the Truckee River Trail home. Along the way we passed so many other bicyclists. I rang my bike bell at each person and greeted them with "Good morning!" and "Happy Easter!!". If they weren't smiling before, a smile would break across their face and one guy gave me the thumbs up. 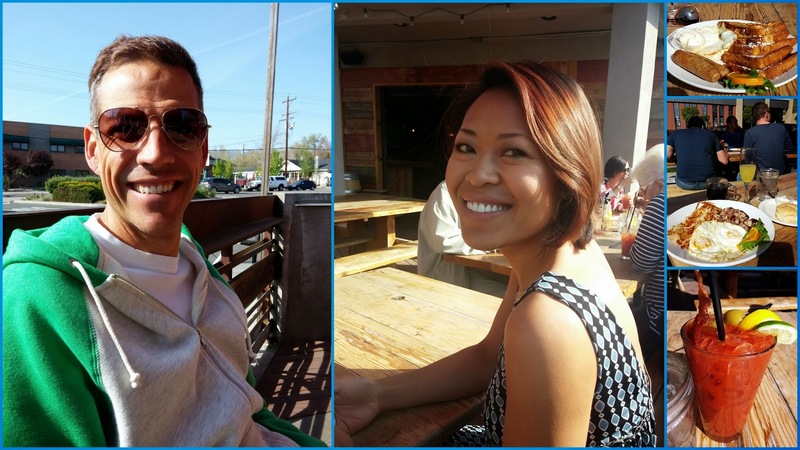 I love riding my bike, especially when I can ride it with my husband. We always have so much fun together!! Since we weren't in a hurry to get home, we decided to check on the progress of the Southeast Connector Project. The bridge appears to be complete the trail is still closed on Greg Street. Greg Street is also closed to pedestrians and bicyclists, south of the I-80 E off ramp. 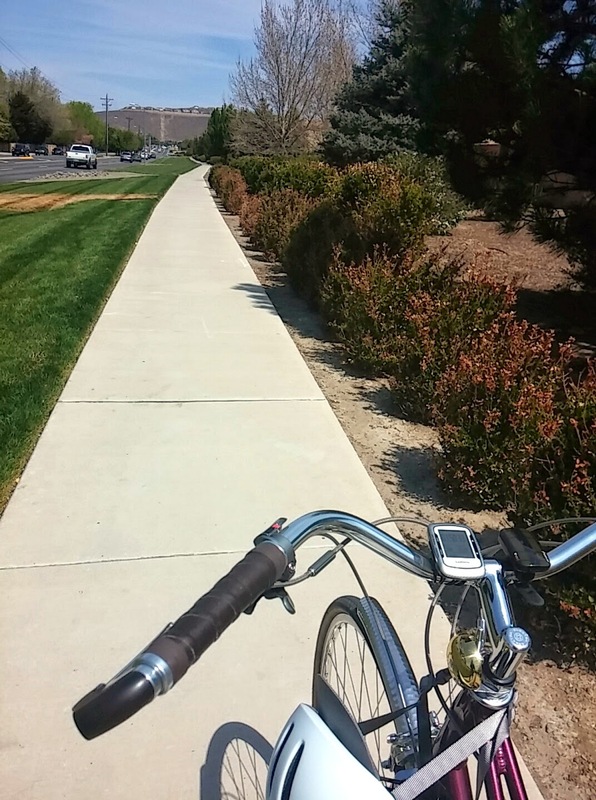 If we don't move before the project's completion, my husband will have a way to ride his bike from our home near Vista Boulevard to South Meadows where he works. On our way home we rode along a great side street called Lillard Drive. You can get on it from Prater Way or Wild Island Family Adventure Park to avoid part of Vista Boulevard. Lillard Drive is a nice wide street that has bike lanes. It would be a great place to teach new bicycle riders how to navigate the roads on the weekend when the businesses are closed and traffic is nearly dead. I do wonder why industrial parks seem to have bike lanes though. Are there bike messengers who use the bike lanes...or?? Then a few miles from home my bike had a punctured tube. We had planned to stop at the grocery store on our way home to pick up a few items. So my husband rode home to get the car while I walked my bike to the grocery store. There was no need to repair the tube since we were so close to home. This was my fourth puncture and it was starting to get a little annoying LOL. They were all from goat heads in the tire. It is one thing to get a flat tire on a joy ride but it was not convenient to have when commuting to work and trying to get home. Soon after we arrived at home from the grocery store, my husband did a thorough check of my commuter bike and made some adjustments. I am pretty hard on my bike since I ride it to and from work, around bike races and to run errands. It seems to need a tune-up every other week, LOL!! 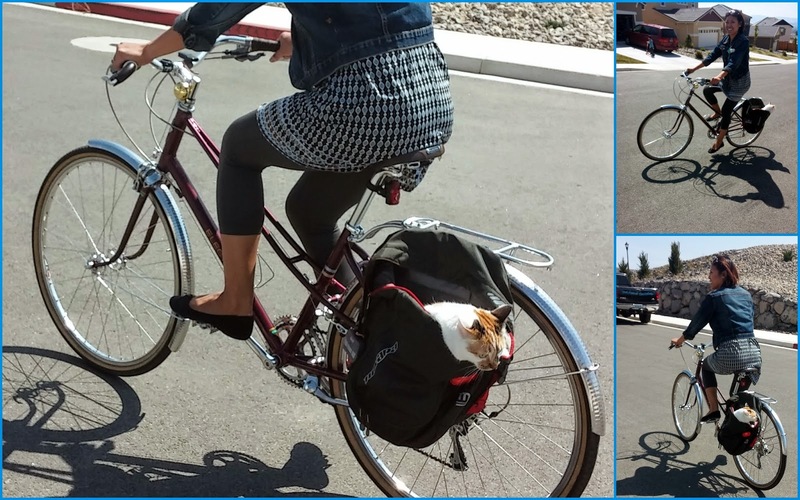 I took one of our cats on a bike ride in my pannier to test it out!! She really enjoyed her bike ride within the neighborhood. My cat enjoys riding on a bicycle! Really nice write up Cuter commuter! Wifey and I often do the route you describe backwards for our trips from the old NW Reno to Great Basin Brewery in Sparks. It was good to see you out to the BPAC meeting this month as well. Good to see you at BPAC and thank you!! Do you and your wife come to this area on Tuesday evenings? I think we need a Bike to Brew event where we can meet up at GBB in Sparks for Tightwad Tuesdays!! What do you think?? Cycling CAN Do This for You!